Brazil’s new regulations on gold mining in the Amazonas State that limit, but don’t outlaw the use of mercury, has scientists and activists up in arms. Scheduled to go into effect on Aug. 9, the decree passed by the State Council on the Environment in May is awaiting final approval as it has faced increased opposition by stakeholders concerned about mercury’s impact on human health and the environment. Scientists, reports SciDev Net, have asked President Dilma Rousseff to consider what they deem as more environmentally friendly alternatives, such as the use of cyanide, which they say is less harmful. Under the new legislation, miners are allowed to use mercury if they obtain a permit and a document “attesting the origin of the mercury within 30 days of the issuance of environmental permits,” according to TerraAmerica. The use of mercury in small-scale operations, labelled as 'artisanal' mining, in Brazil is controlled, but high. 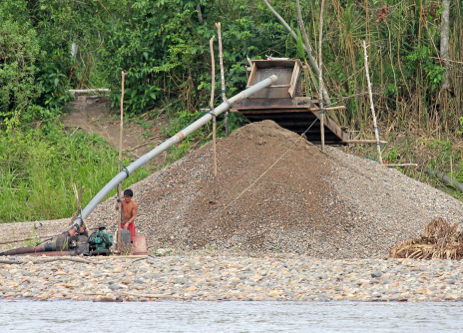 About 50 tons per year are used illegally in gold activities undergoing at the biologically rich Amazon region. Two weeks ago, Brazil’s Environment and Sustainable Development, Nadia Ferreira, suggested that, with the appropriate environmental license, the use of mercury in gold mining should be allowed in the Amazon for at least another five years. But the Executive Secretary of the Brazilian Agency for Technological Development of the Mining Industry (ADIMB), Onildo Marini, says the issue of logging the Amazon region for mineral exploration, is considerably less harmful than the use of mercury. The general coordinator for the Brazilian Environment and Renewable Natural Resources Institute (IBAMA), Rodrigo Dutra, cites research indicating that the mercury used in mining has been permeating the local food chain. “Carnivorous fish accumulate mercury and humans who eat such fish, eat the metal too,” he told Agência Brasil. When consumed, mercury can severely damage neurological development in fetuses, even when the mother may show no symptoms. Inhaling mercury may trigger tremors, mood swings, neuromuscular changes, kidney and respiratory failure, and even death.